Maryville will be the innovative leader in higher education promoting a revolution in student learning that expands access and opportunities for all. 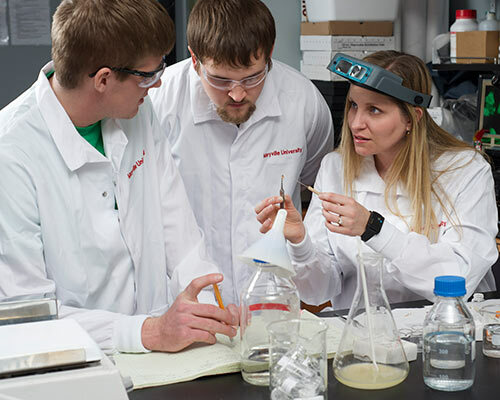 Maryville University is an outstanding national university offering a comprehensive and innovative education focused on student learning, outcomes and success. This education is built upon an innovative liberal arts foundation leading to compelling programs in the Arts and Sciences, Health Professions, Education and Business that prepare students for a life of engagement and achievement in multiple fields of endeavor. Provide compelling programs in the Arts and Sciences, Health Professions, Education and Business that lead to successful student outcomes. Reflect the cultural diversity of the global community and build inclusiveness and global awareness through intentional programming. Make the values of innovative leadership, civic engagement, and sustainability prominent aspects of the student experience. Maintain a vibrant campus community through outstanding athletics, cultural events, and intellectual exploration. Maintain a collegial environment embracing the values of academic freedom, fiscal responsibility, and participatory university governance. Provide our students in the St. Louis region with living-learning experiences that serve the needs of a diverse community. Provide comprehensive and accessible academic programs for non-traditional adults that help them adapt to a changing workforce and meet their career goals.